Spotted an interesting bit in The Times Magazine earlier today, written by Sarah Vine, discussing red lipstick. She is of the opinion that red is frightfully unappealing to the male gender, largely because of the ephemera it leaves behind: marks on glasses and bread rolls. I personally never attempt eating a bread roll on a date, so I couldn’t possibly comment as to this, but it would appear Ms Vine is unaware of the existence of Lipcote. Her other source of ire relating to the red stuff is the fact that it gets all clogged up and makes lips look dry. Vine is convinced that men find the whole look rather repellent, and that they would much prefer some sort of berryish stain or gentle gloss on the lips. My response? I don’t give a fig. Red lipstick is my armour. It doesn’t go on every day, but when it does, it gives me power. It’s like my energy store. I wear red lipstick precisely for the reasons Vine is unhappy about: because it makes me untouchable. Red lipstick turns me into a fetishist. It dictates my entire evening – what I eat, what I drink. The masochist in me enjoys that hugely. Tightly, rigidly controlled. Treading a certain path. It’s the same, slightly sick, joy I get from wearing insanely high heels. I am trapped, unable to run, stuck on one course. And of course, the most wonderful part is the message it sends out to your male companion, whether they know it or not. When I go out in my red lipstick, I am saying ‘you won’t be kissing me tonight. I have decided that. You have no say in the matter’. The simple matter of a choice of one cosmetic represents an entire power struggle, a quiet coursing of electricity, of dashed possibility and unattainable promise. Red lipstick says that I am self-contained. Red lipstick says I am selfish, only thinking of myself, to hell with anyone else. It says I am fearless and that I am not yours, not tonight. It says that you may look at me but not touch me. So in a way, I suppose I agree with Vine in that sense – that men may subconsciously find the stuff uninviting. And what? Who says that I wish to go around with inviting lips, hmm? If I wear my red lipstick to a party when I am already attached, it is a reassurance, a tiny devotion to my chap, because it says ‘I simply won’t be physically able to kiss anyone else apart from you, whether I should want to or not’. When I return home and divest myself of the stuff, and stand before you, bare lipped, you know I am available to you. And that I am vulnerable again, girl not woman. So that is my argument for red lips. Any fool can go out with a bit of strawberry coloured lip balm on, but it takes a true artist to go out in red. After all, lip gloss has never been iconic. 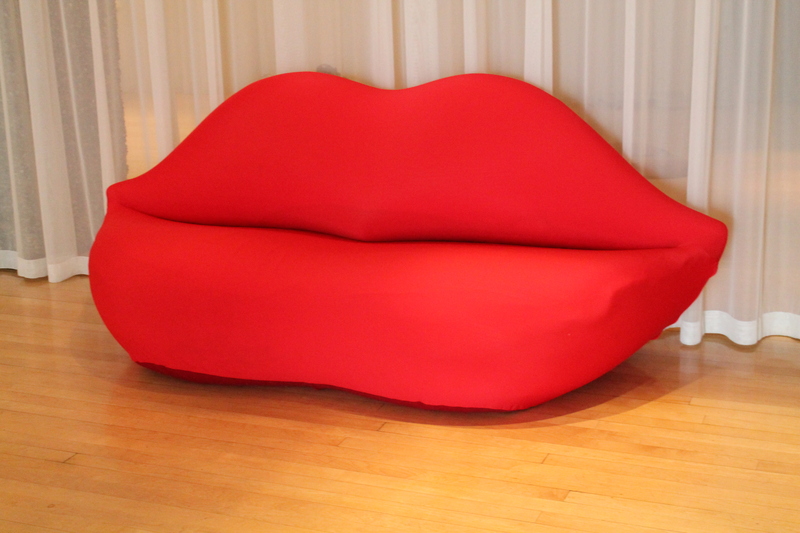 And there is a reason the Dali sofa, inspired by Mae West’s lips, is red. I love this little post. Completely agree with you. Thanks Mia! I wasn’t going to let that one slide! Too right! I really enjoyed reading this, Amelia. You have real talent. And you really look like Clémence Poésy, by the way.